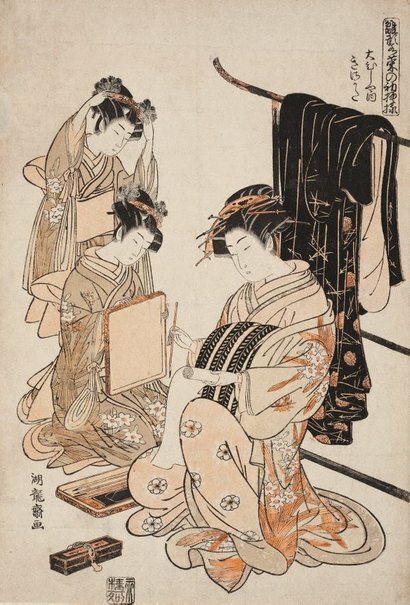 The elegant courtesan ('oiran') is shown writing, presumably a poem or witty exchange with a suitor. Beside her are her two assistants and an inkbox with all its contents on the floor. The print belongs to a series comprising over 110 prints, published in the mid 1770s to the early 1780s, each to show a new kimono pattern. Sample patterns for kimono were conventionally printed in the flat kimono shape, but in this series, popular courtesans are dressed in the new patterns. Her robe is decorated with pine needles and a set of the symbols that denote a chapter of the classic 'Tale of Genji'. The Asian Collections, AGNSW, 2003, pg.249. Signed l.l., in Japanese, ink [incised on block] "Koryûsai ga [picture by Koryûsai]". Not dated. Reflections on Japanese taste: the structure of iki , Sydney, 1997, 84 (illus.). The Asian Collections Art Gallery of New South Wales , 'The Floating World', Sydney, 2003, 249 (colour illus. ).